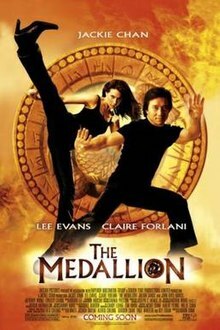 The Medallion (Chinese: 飛龍再生) is a 2003 action comedy film co-written and directed by the Hong Kong film director Gordon Chan, and starring Jackie Chan, Lee Evans, Claire Forlani and Julian Sands. It was much less successful than Chan's other American films such as the Rush Hour film series, Shanghai Noon and its sequel, Shanghai Knights. The film was theatrically released on 15 August 2003 in Hong Kong and 22 August 2003 in the United States by TriStar Pictures. In the story, Eddie (Chan) is a Hong Kong police officer hired by the Interpol to capture a crime lord known as Snakehead (Sands) and prevent him from kidnapping a chosen boy with special powers and a medallion that gives superhuman power and immortality. Much of the film features supernatural and mystical themes, though it is filled with action and comedy. The film received negative reviews from critics and it earned $34,268,701 on a $41 million budget. Eddie Yang (Jackie Chan) is a Hong Kong police inspector co-operating with Interpol in the capture of a crime lord named AJ "Snakehead" Staul (Julian Sands). Snakehead procures an ancient book from a Chinese bookstore keeper, which tells the story of a boy being chosen every thousand years to bind the two-halves of a legendary medallion. In Hong Kong, Eddie and Interpol agent Arthur Watson (Lee Evans) lead a raid to capture Snakehead and his men, who are about to kidnap the boy, named Jai (Alex Bao). Eddie and the agents fight off Snakehead's men, infiltrating the temple containing Jai. Jai is saved but Snakehead eludes them. Two weeks later Snakehead captures Jai aboard a cargo boat in Hong Kong. Eddie and a team of Hong Kong police engage and defeat several of Snakehead's men, but Snakehead escapes with Jai to Dublin, Ireland. In Ireland, Eddie is assigned to help Interpol with the investigation, much to Watson's annoyance. Eddie is also reunited with his girlfriend, a British Interpol agent named Nicole James (Claire Forlani). By chance Eddie later encounters and apprehends one of Snakehead's top men, who confesses Jai is being held in the harbour. Eddie, Watson, and Nicole move to rescue Jai, defeating several Snakehead agents in the process. Eddie and Jai end up trapped inside a container, which is knocked into the water by one of Snakehead's men before they can be released. Eddie keeps Jai alive by finding an inflatable tent, and securely putting Jai inside but Eddie dies from drowning. After being rescued, Jai uses his medallion on Eddie's body. In the morgue, Watson is grieving over Eddie's body and is prepared to say his last words, when Eddie suddenly appears beside him. Eddie realises Jai used the medallion to resurrect him, and his former body vanishes into nothingness. Jai splits the medallion into its two-halves, giving one of them to Eddie. Snakehead's men appear in the hospital to recapture Jai and during the fight, Eddie discovers the medallion has also granted him superhuman strength and immortality. Nicole looks after Jai but he is captured again by Snakehead. At his castle hideout, Snakehead forces Jai to activate the medallion so he can gain its power, but with only one half of it, Snakehead only gains superhuman strength and remains mortal. To steal the other half, Snakehead and his men attack Watson's family. Watson's Chinese wife is revealed to be a police operative like him, much to Watson's surprise as he kept his job secret from his family. Together they fight off the attack from Snakehead's men. Eddie, Watson, and Nicole learn the location of Snakehead's castle lair and go to finish him once and for all. The operation runs smoothly at first, but Snakehead kills Nicole and becomes immortal. He and Eddie engage in a vicious fight, until Eddie uses the medallion to take away the life it gave, which leads to the two dragons from the medallion appearing and taking Snakehead, which traps him in the medallion. Jai allows Eddie to use the medallion to resurrect Nicole, who also gains super-strength and immortality. The two then run at superhuman speed into the distance as Jai enters another dimension through a portal, frightening Watson. With a projected budget of $35 million the film was at the time the most expensive Hong Kong production ever. The working title of the film was Highbinders. In the original plot of the film, those who were given power by the medallion became Highbinders. Snakehead's original goal in the film was to create an army of Highbinders to join in his crime organisation. According to the commentary by the editors, The Medallion was not American-made, although Columbia-TriStar bought the distribution and editing rights worldwide except in Japan, France, and Hong Kong (but these three countries retain the American cut of the film, the only cut ever made). The original cut was meant to be around 108 minutes, and the plot of the film explained Snakehead's crime organisation of human smuggling, and the deaths that occurred from it, as well as his desire to create an army of Highbinders to aid his crime organisation. All of this was cut to focus on the medallion. As a result of several scene cuts, some of the original dialogue was overdubbed, including a small amount of Cantonese dialogue. Over twenty minutes of these deleted scenes can be viewed on the US DVD. Among these scenes are alternate endings where Eddie prevents Nicole's death, and an extended fight sequence between Eddie and Snakehead's men, and an alternate ending to the chase sequence between Eddie and Giscard. Filming took in August 2001, in Dublin, Ireland. Production took a break while Jackie Chan shot ‘The Tuxedo’, and production resumed in Asia later that year. Filming took place in Dublin Castle, and in the Wicklow countryside. In its US release, The Medallion was No. 5 at the box office on its opening weekend and fell steadily lower during its 10-week release. Overall, it has earned $22.2 million, ranking No. 42 among all martial arts films released in the US and eighth among the Jackie Chan films distributed in the US. The film received negative reviews from critics. Rotten Tomatoes gives the film a rating of 17% based on reviews from 125 critics. On Metacritic the film has a score of 38% based on reviews from 30 critics, indicating "generally unfavorable reviews". Audiences surveyed by CinemaScore gave the film a grade B.
Mick LaSalle San Francisco Chronicle: "The best of Jackie Chan's American movies, a pleasant little action comedy that makes one wonder how other filmmakers could ever get it wrong." Roger Ebert Chicago Sun-Times: "A disposable entertainment, redeemed by silliness, exaggeration, and Chan's skill and charm. I would not want to see it twice, but I liked seeing it once." Ebert called it an improvement over The Tuxedo but not as good as Shanghai Knights. Steven Rea Philadelphia Inquirer: "Chan's signature mix of screwball comedy and gymnastic derring-do landed him his own cartoon series a few years back, and The Medallion -- with its bumbling spies and bounding star -- is about as cartoonish as live action gets." Dennis Harvey Variety: "At times plays as if it were aimed at children, but more often simply seems to be aiming blind at whatever genre cliche the five credited writers fix upon in any given scene." Wesley Morris Boston Globe: "Moves from cheekiness to ineptitude, often in a single take." Jami Bernard New York Daily News: "Evans fumbles through painfully extended homophobic jokes, weak double entendres and agonizingly contorted double-takes." Marc Savlov Austin Chronicle "One of the Peking Opera-trained superstar's most mediocre films, rivaling last year's God-awful "The Tuxedo" for sheer messy filmmaking and brazen acts of tedium... Abysmal." ^ "Jackie Chan's 'Highbinders' Starts Principal Photography". IFTN . 2 August 2001. ^ "'Highbinders' Is First Big Budget Asian Shoot In Ireland". IFTN . 27 August 2001. ^ "The Medallion". Box Office Mojo. Retrieved 3 December 2006. ^ "The Medallion". Rotten Tomatoes. Retrieved 31 March 2019. ^ "The Medallion". Metacritic. Retrieved 31 March 2019. ^ "Cinemascore". CinemaScore. Archived from the original on 20 December 2018. Retrieved 31 March 2019.